Saturdays at 11:30 a.m. ET on WICR 88.7 FM. With its devastating impact and its tendency to strike children, teenagers and young adults, polio created widespread panic during the 1940s and '50s. Epidemics of the often-fatal disease occurred in earlier decades as well, but Hoosier History Live! will focus on the 1940s and '50s because of some significant aspects that unfolded in Indiana then. "It was so frightening because, even though we knew polio was caused by a virus, we didn't know how it was being transmitted," recalls Wanda Fortune, an Indianapolis civic leader who will be one of Nelson's guests. "Feeding the fear," says Eloise Batic, "was that the treatments seemed to be as frightening as polio itself. The image of an iron lung terrified people, particularly children." Eloise, the director of exhibitions research for the Indiana Historical Society, will join Nelson and Wanda on our show to share insights about the era and the Hoosier aspects. Wanda has been widowed twice. Both of her husbands were involved with the "polio story" as it unfolded in the Hoosier capital. Her first husband, a surgeon who was treating child patients with polio in 1945, contracted the disease himself and spent a week in an iron lung. Her second husband was a top analytical chemist at Eli Lilly and Co. in the 1950s. 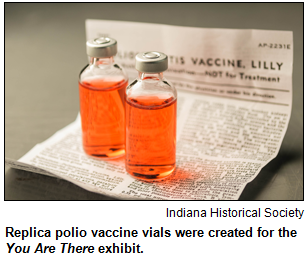 That's the era depicted by the historical society in a new "You Are There" multimedia exhibit that is set on the Lilly campus, where employees rushed to pack vials of the new vaccine discovered by Dr. Jonas Salk. More than 20,000 cases of polio were reported every year across the country during the early 1950s. According to the historical society, about 75 percent of the cases in 1954 - the year before Salk developed his vaccine - occurred in people under age 20. The peak years for the polio epidemic in Indiana were 1949 (when 1,147 cases were reported) and 1954 (with 1,448 cases), according to the historical society. In the mid-1940s, Wanda's first husband, Dr. K. Randolph Manning, was in his residency as a young orthopedic surgeon. He was treating child patients at Indianapolis hospitals when he was afflicted with polio; Wanda had been married to him for just three months. "Randy was very fortunate because he recovered and was able to resume a full life, including his medical practice," she says. 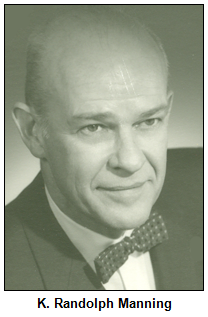 Her second husband, Dr. Brooks Fortune, helped oversee research and development (as well as quality control) at Lilly. Wanda married him long after 1955. That's when employees - including women assembly workers at Lilly depicted in a photo that has inspired the new Indiana Experience at the Eugene and Marilyn Glick Indiana History Center - hurried to pack and send the vaccine around the world. Salk's discovery of the polio vaccine is considered one of the greatest medical breakthroughs in history. Lilly was one of five companies across the country funded by the National Foundation for Infantile Paralysis (which later became the March of Dimes) to begin, in advance, mass production and distribution of the Salk vaccine. The polio virus, spread by contaminated water or food, entered the central nervous system of victims. In severe cases, it caused lifelong paralysis or death. Although cases of polio had been reported in the United States before the 20th century, the first major epidemic occurred in 1916, when more than 27,000 people were paralyzed and 6,000 died, according to the historical society. After 1916, polio outbreaks occurred almost every summer. Treatments before the Salk vaccine - hailed as a miracle - included surgeries to lengthen tendons and limbs; electrotherapy; the "Sister Kenny" treatment (named for an Australian nurse) that involved the application of hot, moist packs to relieve muscle spasms as well as forms of physical therapy; injections of antibody serums and the iron lung. A pediatric iron lung - used for infants and toddlers stricken with the virus - is displayed in the historical society's You Are There exhibit; it is on loan from the Indiana Medical History Museum. Some victims remained in iron lungs for years. Fortunately, Dr. Manning, Wanda's husband, spent only about one week in an iron lung before he began to recover. Not only was he able to resume treating young patients, Dr. Manning and Wanda had four children of their own. When they married, Wanda had been training to be a nurse in Indianapolis; one of her nursing-school classmates was stricken with the polio virus and has suffered extensive paralysis ever since. 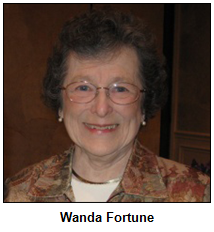 Wanda, a member of the historical society's board of trustees, was widowed in 1984 after nearly 40 years of marriage. In 1990, she married Dr. Fortune, the analytical chemist who had an extensive career at Lilly. Even decades later, Dr. Fortune was being thanked by physicians as far away as South Korea for his role in overseeing the manufacture of the Salk vaccine, which was shipped around the world from the Lilly production and packaging center. "Lilly was a well-oiled machine by the time the Salk vaccine was becoming available," Eloise notes. 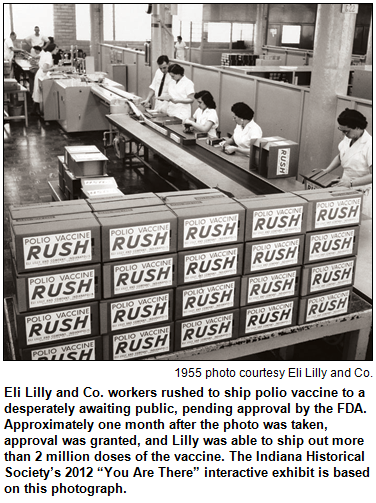 The manufacturing and packaging at Lilly began in March 1955 - a photo that inspired the new exhibit was taken March 16 at Building 314 on Lilly's campus - even though the Salk vaccine wasn't approved for distribution until April. That way, shipments were ready instantly. By 1960, polio cases in America had dropped to just 3,000, according to the historical society. In 1970, there were about 10 cases in the country. Elsewhere in the world, where access to the Salk vaccine is difficult, polio remains a concern. 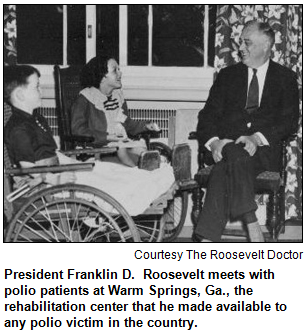 Franklin D. Roosevelt, one of the nation's best-known polio victims, visited Indiana several times. During a visit while president in the 1930s, FDR attended the dedication of a massive memorial in southern Indiana. The memorial, which honors a military leader who shaped Indiana's history, is said to be the largest memorial west of Washington D.C. that pays tribute to an individual. Question: Name the famous historic figure honored with the memorial dedicated by President Roosevelt. To win the prize, you must call in with the correct answer during the live show and be willing to be placed on the air. Please do not call if you have won a prize from any WICR show during the last two months. The call-in number is (317) 788-3314, and please do not call until you hear Nelson pose the question on the air. 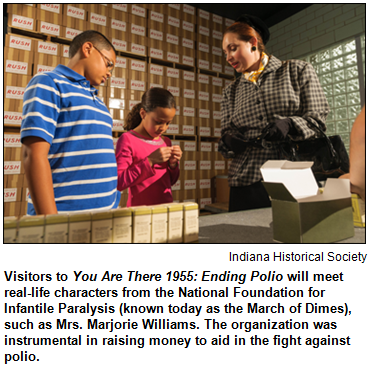 This week's prize is four tickets to the Indiana Experience, including You Are There: 1955: Ending Polio. These tickets are courtesy of the Indiana Historical Society. You also receive a one-night stay at the Fairfield Inn by Marriott Indianapolis Downtown, which is courtesy of the ICVA. We welcome back Roadtripper Chris Gahl of the ICVA to our airwaves this Saturday! He'll tell us about Pines Hills Nature Preserve southwest of Crawfordsville, which is a hidden treasure for hikers and was also the first project of the the Nature Conservancy's Indiana Chapter. You'll see rock formations at Pine Hills that few ever see, including the Devil's Backbone, which is a strip of rock about six feet wide with nothing but sheer cliff on either side of it. You'll also see graffiti from the 1850s, and it's also very near to Shades State Park. Have a great hike, and this suggestion is courtesy of Eric Grayson. 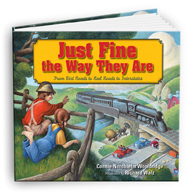 Please tell our sponsors that you appreciate their support: Aesop's Tables | Just Fine the Way They Are, a children's book about the National Road | Indiana Historical Society | Lucas Oil | Story Inn. Acknowledgments to Print Resources, Monomedia, Indiana Humanities, Indianapolis Convention & Visitors Association, WICR-FM, Fraizer Designs, Heritage Photo and Research Services, Conner Prairie, Derrick Lowhorn and many other individuals and organizations. We are an independently produced program and are self-supporting through organizational sponsorships, grants and through individual tax-deductible contributions through Indiana Humanities. Visit our website to learn how you can support us financially. His towering list of civic and business endeavors - from serving as board chairman of one of Indy's largest privately held firms to leadership posts at the Indiana State Fair Commission, Indianapolis Motor Speedway Corp., Indiana Chamber of Commerce, Indianapolis Public Schools and the Indianapolis 500 Festival Association - almost could stack as high as Mount Kilimanjaro. Adventure-seeking Andre Lacy has climbed that volcano in Tanzania. He's also an avid motorcyclist, scuba diver and whitewater rafter. Not only that, Lacy pilots a plane that he owns. A few weeks before he is named a Living Legend by the Indiana Historical Society, Mr. Lacy will join Nelson in studio for a look at his life, career, civic endeavors and passions. Andre Lacy is the chairman of LDI Ltd., formerly Lacy Diversified Industries. It, in turn, evolved from a company founded by his grandfather in 1912 that became one of the country's largest makers of cardboard boxes. But Andre Lacy is known as much for his civic activities as his business success. Not only is he an alum of Shortridge High School (a member of the Class of '57, Mr. Lacy was inducted last month into his alma mater's hall of fame), he served as president of the IPS board in the mid-1980s. He's also an alum of the renowned Stanley K. Lacy Leadership Series, a program for emerging civic leaders. It was established by his mother, Edna K. Lacy, in honor of Andre Lacy's brother, who was killed in an automobile accident. Andre Lacy and his wife, Julia, have three adult sons. One of them, J.A. Lacy, has been named chief operating officer at LDI, which, according to the IBJ, is preparing to hand off leadership to him. The IBJ also reported that Andre Lacy, despite being in his early 70s, rode a motorcycle to the Arctic Circle last year. So there's much turf for us to cover with this Living Legend-to-be. 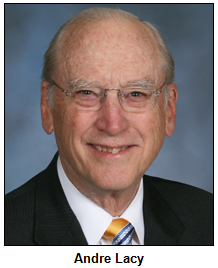 By the way, other Hoosiers who will be named Legends at the historical society's annual gala include a fellow inductee into the Shortridge hall of fame, Max Schumacher, the longtime president of the Indianapolis Indians. Others to be named Legends at the July 20 gala are Gerald and Dorit Paul, arts and cultural leaders in Indy. © 2012 Hoosier History Live! All rights reserved.